Beach wedding is my dream wedding ideas and I realize I have been pinning them quite often in my pinterest. 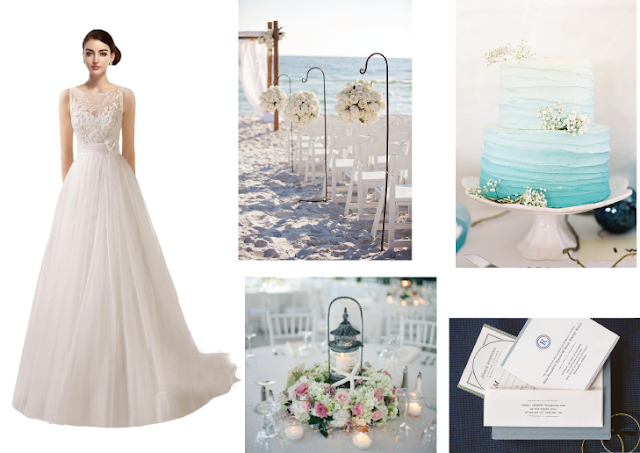 My ideal wedding would be having the ceremony along the sandy beach with alfresco dining. Food should be marvelous with both seafood and non-seafood option. Champagne must be shared generously and a little sparkle of fireworks won’t hurt. Decor should be sophisticated as simple, but not too grand. It would be great if there are candles and shells for the DIY table centerpieces Ombre cake is trending lately and a sea-themed ombre colour would be just perfect! Last but not least, beach wedding dresses should be elegant but not too much. Its train should not be too long, comfortable to wear, but accentuate our silhouette. It definitely should be something wearable for dancing on the sand and under the moonlight. I prefer a dress with slight A-line cut or column silhouette in mix organza fabric. Pretty wedges sandals would be good to match. Meanwhile, the headpiece can be made from natural flowers and twigs to bring out the nature theme. beautiful post, thank you for sharing !